Chambers Dictionary defines a herb as an aromatic plant used in cookery; a spice it says, is any aromatic vegetable substance used for seasoning food. Hmm. What we generally think of as herbs don’t play as large a part in Asian cooking as spices do - although there are some spices that could equally well be called herbs! Lemon grass, for example, is to be found on our Spices page, but could be here.Let’s look now at three herbs that are used in Asian cooking. One will be very familiar to you – although possibly as a spice - while the other two may be less well-known. In a cave somewhere in Israel, archaeologists found coriander seeds over 8,000 years old, and the Bible tells us that manna, the bread given by God to the wandering Israelis, was ‘white like coriander seed,’(Exodus 16:31). The ancient Chinese, meanwhile, believed that coriander seeds could bestow immortality. When the Romans brought coriander to Britain it was already being used throughout the Mediterranean area by Greek physicians. The Romans used it to preserve their meat and to flavour their bread. You might see it being sold or referred to as cilantro. It’s available in ground, seed or leaf form, and has a lemony-gingery flavour. To freeze coriander, chop the leaves finely and place in an ice cube tray with a little water. Take out a cube or two when needed. The plant that produces curry leaves grows naturally in India, Thailand and Sri Lanka. Although it’s been grown for personal use for some time, it’s only fairly recently that its cultivation on a large scale has begun. It’s been discovered that curry leaves contain a chemical compound that may possibly provide an effective treatment for diabetes. It’s also used in traditional medicine to treat skin and digestive conditions. The curry leaves have a spicy citrus smell and a warm lemony taste. 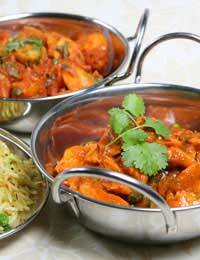 They are mostly added as a final touch to Indian dishes. In Indian stores you may find them labelled as Meetha Neem or Kari Patta. You can freeze curry leaves as you would coriander leaves. The betel plant is a native of Malaysia and is used in Asian cooking as a wrap. Like a vine or banana leaf it may be wrapped around spicy minced meat; or the betel may enfold a mixture of spices such as cinnamon, cloves and cardamom and be chewed like gum. Betel chewing is a habit of about one-tenth of the world's population, but recent research has linked habitual betel chewing to oral cancer. On the Indian sub-continent, it’s considered very polite to offer your guests betel morsels (pan-supari). Coriander and curry leaves can both be grown on your window-sill.Coriander seeds are easily available from garden centres. Follow the instructions on the packet. Pick the leaves as soon as they’re ready and make sure the pot or window-box is well-drained. Coriander doesn’t respond well to over-watering. When the coriander has flowered you can dry the seeds to re-sow. Cut off the flower heads and place them in a paper bag. Leave them, preferably hanging upside-down, in a cool and airy place. When the seeds have dried off, store them in an airtight container. Curry leaves can be propagated from stem cuttings. You’ll need some fresh curry leaf stalks, not too young and green, and not too old and hard. Strip the stalk of its lower leaves and cut it at an angle just above a node, then dip in some rooting powder or plant direct into small pots containing a mix of potting compost and gravel.